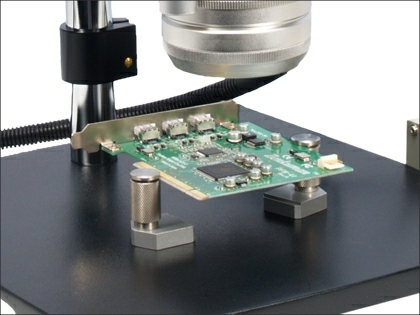 The Inspectascope is a new addition to our range of microscopes designed for screening and quality control functions. The Inspectascope is ideal for producing video clips that can demonstrate detail within holes and depressions in a specimen. Ideally suited for scanning electronic circuit boards for example. The instrument consists of a heavy duty base and pole stand with a microzoom monocular microscope unit with zoom control and 3D rotation mechanism. The unit has a fully mechanised rotating mirror system that allows an image to be formed from a 360° perspective of the specimen. This is particularly effective for electronic circuit boards and similar objects with depth. 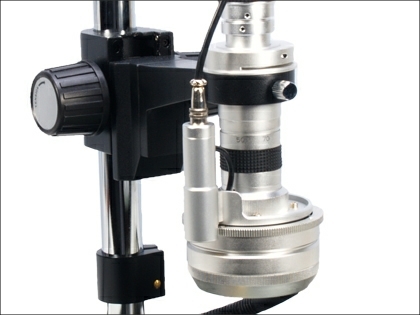 The Inspectascope has a rack and pinion focus system with the ability to change specimen to microscope height by the pole stand coarse focus arrangement. The square heavy duty base measures 550 x 550mm and provides an excellent working area. The unit has an excellent HDMI visualisation system that delivers an image directly to TV/Monitor, or it can be directly connected to a laptop/PC to capture and manipulate digital images. Integral lighting is provided by a circular array of multiple LED lights situated in the head of the microscope. The stand alone control box allows continuously variable lighting intensity and rotation speed that can be clockwise or anticlockwise or static. 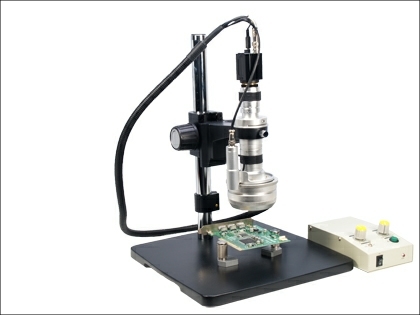 This is an extremely well designed and robust version of this type of microscope and is very competitively priced. The styling, attention to detail and smooth operating system is quite remarkable in an instrument of this price. This is a very practical piece of equipment that would have very specific applications in screening of manufactured items and quality control at relatively high magnification. It is difficult to demonstrate its abilities in a static web page, and two short video clips have been included.  These are very low resolution ‘clips’ to allow fast download, and serve only to show the 3D nature of the image produced by the Inspectascope and not its resolving power which. is greatly superior in reality.